You got the locations right. I disagree. The illustration is not clear but the "Funny Cusp" seems to be a line through two opposite corners. This is wrong in my opinion. The line cusp is through the closest approach (through the nub of a WB6 like machine). This is true, but actually is in the region of the "Funny Cusp" in earlier touching magnet designs that I believe Bussard was referring to. He called the corner cusps point cusps, though this was an approximation at best. He even used virtual corner magnets to illustrate the point cusp corner characteristics. This was again, and approximation at best once the fallacy of the 'Funny Cusps" was appreciated. 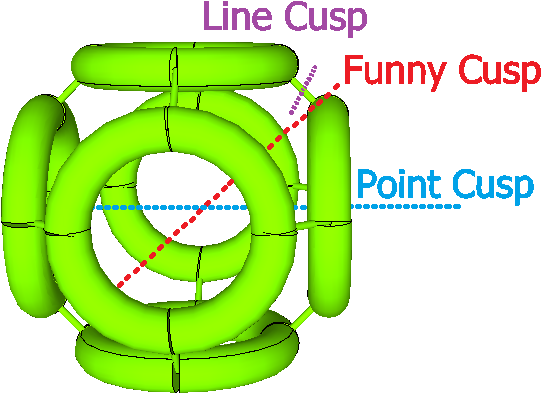 The "FunnyCusp" was a name applied to describe the line cusp between two magnets with zero separation between the magnets. This was an artificial device due to the computer modeling that assigned the magnet dimensions as being a mathematical line representing the magnet, instead of a real dimension with a minor radius of perhaps 7 cm (approximate minor radius of a magnet in WB6). With a zero width magnet separation there is no funtional cusp loss area and the surface area is zero and thus no ExB losses. This admitted simplification governed earlier research. It was only with WB6 that the realization of this flaw was addressed. That is why there is separation between the magnets only in WB6, not in earlier machines. The gained appreciation that real dimensions could not be ignored also led to the provision that the magnet cans needed to be conformal with the magnetic windings as much as possible. This so that ExB diffusion did not lead to undesired impacts on the physical can surfaces any earlier than could be avoided. Look at WB4, the cans touched (as well as having large "doghouse" connections/ nubs). With the cans touching the B field would be maximum, there could not be any fall off to a mid distance between the magnets (distance was zero). This approximated the conditions in a point cusp with the hole in the center of a magnet being zero width. Because of this Bussard, etel considered the "Funny Cusps" as being zero loss areas that separated the corner point like cusps. The term Funny Cusp is an archaic term based on early flawed understanding. It should be avoided except as a historical reference to the evolution in the thinking. Once the need for separation of the magnets was realized, the nature of the corner cusp and the "Funny Cusp" were more clearly merely a deformed line cusp. The truncated cube Polywell has two opposed magnets typical of a Mirror machine. The equatorial line cusp between was understood to be the major limitation in confinement efficiency of Mirror machines. By placing four additional magnets around this equatorial line cusp region the geometry was changed. Instead of having one wide and long equatorial cusp, you have two as long, but much narrower line cusps (and 4 additional point cusps). The width of these two line cusps are wider at the corners, and narrower where the magnets approach each other the closest (but do not touch as in earlier machines with the resultant "Funny Cusp"of zero width). With nubs connecting the magnets a border for the corner cusps are appreciated, but actually the corner cusps are connected- part of a single warped line cusp . With standoffs this communication or continuation around the circumference of the machine is more evident. Even with the conversion to two warped line cusp entirely around the circumfrence and four additional point cusps, the resultant significant narrowing of the line cusp associated geometry improved confinement. According to the EMC2 patent application this increased overall containment as measured by passes across the machine before escape from 5-7 to about 60. Basically a ~ 10 fold improvement. Funny cusps were where adjacent magnets touched. Without touching (ignoring nubs or standoffs) there is no touching and thus no "Funny Cusps". You could touch the magnets like in WB4 and then a funny cusp might be invoked with zero width cusps and thus no cusp losses in these areas, but this needs to ignore the can wall thickness and any cooling, insulating layers inside the can. And, as mentioned, theoretically this limits or eliminates cusp losses in this area, but promotes ExB losses to a detrimental extent. Bussard came up with a needed separation of ~ 3-5 electron gyro radii to prevent the ExB losses from becoming the limiting factor in the confinement scheme. Perhaps with the above consideration, the Mini- B machine had even greater separation of the magnets. I wonder if this implies even better low Beta cusp confinement was obtained in WB8 compared to WB6 estimates, Presumably this would have been due to using standoffs instead of nubs. The compromise positioning of magnet separation would thus need to be changed for the minimal combined losses through cusp escape and ExB losses. Considerations of recirculation might push separation even further out as a large percentage of the cusp losses might be recovered, but ExB losses are final as the particle hits the can. Note that the appreciation that the 8 corner cusps are actually two warped line cusps leads to the three ring magnet design that I have described in the past. The single ugly wide equatorial line cusp between two end magnets is converted into two much nicer narrow line cusps. Containment is improved (though I don't know if it is slightly better or worse than the polygon magnet arrangement) while maintaining the all important internal volume and quasi spherical properties. This approach is at the root of the Lockheed design. [EDIT] Actually in a polyhedren, there are not two completely separate and independent line cusps as in a three ring design. The line cusp is warped, but without somewhat artificial borders defined by nubs (or a "Funny Cusp") it remains a single line cusp, warped into a swiss cheese like geometry. The line cusp loss areas wind around the four intervening magnets between the two baseline end magnets. The length of the line cusp is actually increased, but the average width is decreased so much the advertized gains are realized. Last edited by D Tibbets on Thu Jun 25, 2015 10:09 pm, edited 2 times in total. To illustrate the line like cusp that is not eliminated or magically converted into point cusps in the Polywell I have included a graphic. Also, the three ring magnet arrangement vs the baseline two opposed magnet mirror machine is illustrated. Both Hanelyp and Tibbitsare incorrect, though Dan is closer to the truth. Remember that the original design of the Polywell was an octahedron or a rectified cubeoctahedron. The WBX that you show is NOT really the design but only an approximation. The technical distinction between the three types of cusps is that point cusp is where a field from a single coil compresses thru the center of the coil, a line cusp is where fields from two opposed coils compress past the closest approach of two coils, and a funny cusp is where the field disappears at the close approach of four or greater even number of alternating coils. They are technically different things. The locations of the nubs in the WB6,7,8 would have been funny cusps if the magnets were square plan-form rather than circular (not cross-section, plan-form). But because the magnets were toroidal (circular plan-form with circular Xsection) the two alternate fields were retracted from the area and what was left was a line-like cusp. PS: In a Polywell, there should be no line or line-like cusps. The existance of them is a demonstration of the inability to make a true Polywell. PPS: In your illustration, you show the red dotted line coming out of the centers of the virtual triangular plan-form coils. Those centers are also point cusps though they are distorted in the WB7 by virtue of the virtual coils being so distorted too.